Paintings discovered in Spain's Nerja caves –discovered by boys hunting bats in 1959 –may prove be the oldest yet found, and the first ever to have been created by Neanderthals. Charcoal remains found beside six of the paintings have been radiocarbon dated to between 43,500 and 42,300 years old. 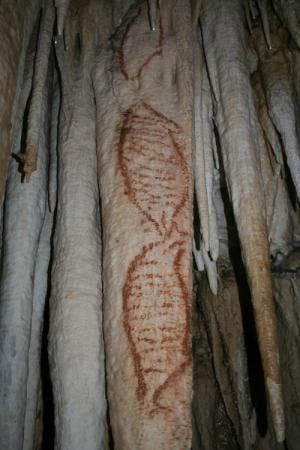 The strange Neanderthal images, resembling the DNA double helix, actually depict the seals that inhabited the region, says José Luis Sanchidrián at the University of Cordoba, Spain. Adding that they have "no parallel in Palaeolithic art." The paintings may prove to be substantially older than the 30,000-year-old Chauvet cave paintings in south-east France, thought to be the earliest example of Palaeolithic cave art. Nerja Caves are one of the most important prehistoric archaeological sites on the western Mediterranean. Dating back some five million years, they are notable for the large chambers filled with stalactites and stalagmites, and the immense length, over 4,000 meters. If the paint pigments are confirmed as being of similar age, this raises the real possibility that the paintings were the art of Neanderthals, which would be "academic bombshell", according to Sanchidrián, because all other cave paintings are thought to have been produced by modern humans and provide the first evidence of same capabilities for symbolism, imagination and creativity as modern humans. Neanderthals are are thought to have remained in the south and west of the Iberian peninsula until approximately 37,000 years ago – 5000 years after they had been replaced or assimilated by modern humans elsewhere in Europe. Sanchidrián does not rule out the possibility that the paintings were made by early Homo sapiens.Dating of the Nerja seal paintings' pigments will not take place until after 2013, while aditional excavations in the extensive cave system is ongoing.